The GEnx-1B has won about a 65 percent share of the Boeing 787 propulsion market to date, and nearly 90 percent in the last 12 months, claims GE. GE Aviation (Outside Exhibit P2) is ramping up production of a new durability upgrade it certified early this year for GEnx-1B engines and—having delivered 14 sets of the upgraded hardware to Boeing 787 operators for installation in their in-service GEnx-1Bs by early June—expects to complete retrofitting the upgrade throughout the in-service GEnx-1B fleet within the next two years. “At this point, essentially everything is finished in terms of the design work from a performance and durability perspective and it is now in production,” Kathy Mackenzie, general manager of the GEnx program, told AIN. “It went into production at the end of last year and we have incorporated it into MRO [visits]. We have delivered 14 into MRO, and by the end of this year, we’ll be into full production,” both for retrofitting GEnx-1B engines already in service and in new-production engines. The new durability upgrade—which includes modifications to the GEnx-1B’s high-pressure turbine (HPT) first-stage nozzles and blades, as well as its combustor lining and fuel nozzles— will offer operators of GEnx-1B-powered 787s approximately 30 percent more time on wing, according to Mackenzie. It follows an earlier, less major durability upgrade that GE introduced along with its PIPS II performance improvement package for the GEnx-1B and PIP package for the GEnx-2B powering the Boeing 747-8 four years ago. 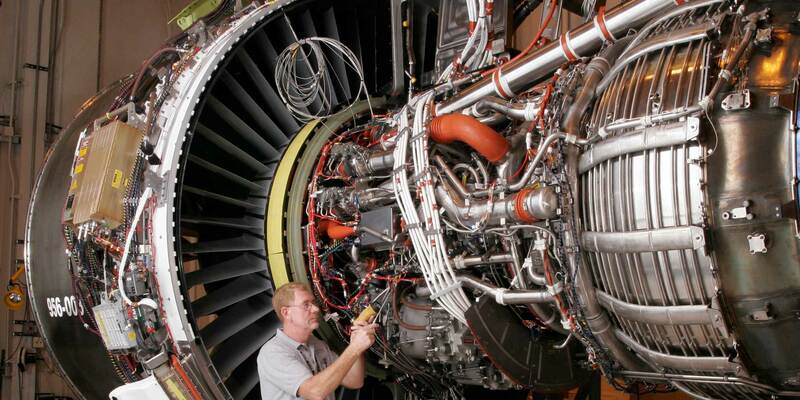 GE managed to incorporate the first, incremental durability upgrade into every engine in the in-service fleet within two years and similarly expects to complete retrofitting the new durability upgrade package in all in-service GEnx-1B-powered 787s—there were 414 such aircraft in service by early June—within a two-year period, she said. GE Aviation also completed certifying the new durability upgrade for the GEnx-2B, the sole-source engine type for the Boeing 747-8, a month after it had certified the upgrade for the GEnx-1B, according to Mackenzie. For GE Aviation this was a natural and relatively easy task to undertake because both GEnx versions “have the same high-pressure system,” she said. As it is doing for the GEnx-1B, GE will incorporate the durability upgrade into all new-production GEnx-2Bs by the end of this year. But while it is now providing sets of hardware to Boeing 787 operators for retrofitting their GEnx-1Bs during MRO shop visits, it will not do so in the near term for retrofits of GEnx-2Bs. According to Mackenzie, this is because GE Aviation designed the new durability upgrade with 787 operations in particularly harsh environments in mind, given that major carriers based in the Middle East operate some of the largest fleets of 787s and are among the largest customers for the GEnx-1B. (The package﻿ is informally called the “hot and sandy durability upgrade.”) On the other hand, very few Boeing 747-8s are based in the Middle East. The new durability upgrade for the GEnx-1B and GEnx-2B incorporates design and hardware changes in four areas of the engine, according to Mackenzie. The upgrade—which is neutral in terms of the engine’s fuel-burn performance and efficiency—was made possible by GE engineers' ability to make design (and/or hardware) changes to the HPT first-stage nozzle so that it does not require as much compressor-bleed cooling air as did the previous design, she explained. Instead, some of this cooling air is redirected to the fuel nozzles and the combustor lining. In the fuel nozzles, “We added some coating and we changed some cooling impingement air on the back faces of the fuel nozzles,” said Mackenzie. In the combustor liners, GE changed the thermal barrier coating and modified the cooling-air pattern to provide a greater flow of cooling air. The new design introduced 3D-aerodynamically shaped cooling-air holes into the lining. The design placing the holes “more deliberately” throughout the lining and also adds more holes. “The 3D shaping allows us to disperse the [cooling] air more efficiently,” she said. The rest of the compressor-bleed cooling air, which is now not required by the HPT first-stage nozzle, is directed instead to the first-stage HPT blades. As with the combustor liner cooling-air holes, GE has changed the geometry of the cooling-air holes in the turbine blades to provide more 3D shaped dispersal of the cooling air over the blade boundary layer. GE also incorporated five air-cooling pathways within each first-stage HPT blade, where the previous design provided three, and gave each blade a thermal barrier coating of a different type than before. Even before the GEnx-2B and GEnx-1B display the time-on-wing benefits that the new durability upgrade is expected to confer, the two engine models are already demonstrating respectable robustness and reliability in service, according to GE. Two years ago GE fixed an ice-crystal ingestion issue that affected both the GEnx-1B and the GEnx-2B as well as an engine inlet lining abrasion problem that some GEnx-1B engines experienced. To date, the time-on-wing GEnx-1B fleet leader has achieved just under 5,000 flight cycles and some 25,000 flight hours, while the highest-time GEnx-2B has achieved almost 6,000 cycles and 30,000 hours on-wing, according to Sergey Kofman, GE Aviation’s marketing manager for the GEnx program. About 500 GEnx-2Bs are now in service. The GEnx-1B is achieving dispatch reliability of 99.96 percent in service, while the GEnx-2B—which powers a four-engine aircraft—is achieving 99.92 percent. GE Aviation expected total GEnx-1B in-service flight hours to be nudging the 10 million-hour milestone by the time the Farnborough show began, Kofman said. GE Aviation does not expect to have any problems in meeting Boeing’s increased engine-delivery requirements when the manufacturer increases its monthly 787 production rate to 14 from 12 today. “We have met all of their delivery requirements and we are supporting their requirements on time,” said Mackenzie. At a Boeing production rate of 14 787s a month, “we probably will do nine to 10” of those, customers having selected Rolls-Royce to power the rest with the Trent 1000. The GEnx-1B has won about a 65 percent share of the 787 propulsion market to date “and nearly 90 percent in the last 12 months,” according to Mackenzie. GE Aviation now has a backlog of more than 400 aircraft shipsets for the GEnx-1B, which she claims is demonstrating 3 to 3.5 percent lower fuel burn than the Rolls-Royce Trent 1000 Package C engine for the 787. For the 787-10, “Boeing hasn’t published results yet, but we think [the GEnx-1B] is 1.5 percent better” in terms of fuel burn. “That also translates to [more] payload and longer routes, which we have been able to exploit with airlines on the revenue line,” said Mackenzie, noting that Qantas operates its record-setting Perth-London non-stop flight with Boeing 787-9s powered by GEnx-1B engines.